Most of us would prefer not to live in totally unkempt surroundings, but Western culture may have taken sanitation a bit too far. Claims that cleanliness is next to godliness have yet to be proven by science, but research does indicate a neat, well-coiffed landscape is bad for bees and other pollinators. 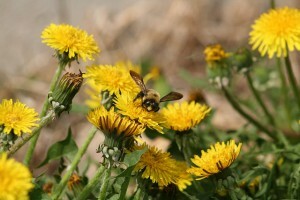 Dandelions are an essential early-season flowers for our 416 species of wild bees in New York. With all due respect to honeybees, they are seldom required to produce fruits and vegetables. Please don’t spread this around, as I do not want to tarnish their public image. But the fact is that wild bees, along with other insects and the odd vertebrate here and there, do a bang-up job pollinating our crops, provided there are enough types of wild plants (i.e., messiness) around to keep them happy for the rest of the season. As landscapes become neater and less diverse, wild bees cannot find enough natural foods to keep them in the neighborhood for the few weeks of the year we’d like them to wallow around in our apple or cucumber flowers. In sterile, highly manipulated environments like almond groves and suburban tracts, honeybees are critical. 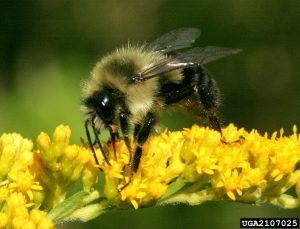 Dr. Scott McArt, a bee specialist at Cornell’s Dyce Laboratory for Bee Research, says there are an estimated 416 species of wild bees in New York State. When I estimate stuff, the numbers tend to be less exact, such as “more than three,” but I’ve met Dr. McArt, and I trust him on this count. Dr. McArt is quick to point out that wild critters take care of things just fine in most places. 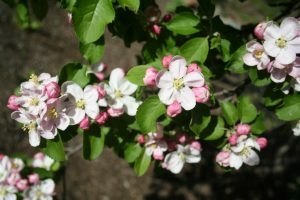 He has cataloged exactly 110 species of wild bees visiting apple blossoms in commercial orchards, and in the vast majority of NYS orchards studied, honeybees have no bearing on pollination rates. My object is not to malign honeybees, but to point out that if we learn to live with a bit more unkemptness, we will improve the health of wild bees, wildflowers, food crops, and ourselves in the process. Dr. McArt has cataloged exactly 110 species of wild bees visiting apple blossoms in commercial orchards, and in the vast majority of NYS orchards studied, honeybees have no bearing on pollination rates. There was a presentation about it at the 2015 Pollinator Conference. Messiness also takes pressure off managed honeybees, an increasingly fragile species, by providing them a rich source of wild, non-sprayed nectar and pollen. Orchardists do not spray insecticides when their crops are flowering because they know it will kill bees. But many fungicides, which are not intended to kill insects, are sprayed during bloom. One of the unexpected findings of research done through the Dyce Lab is that non-lethal sprays like fungicides are directly linked with the decline of both wild bees and honeybees. But banning a particular chemical is not a panacea—the situation is far more complex than that. What is needed to save bees of all stripes is a real change in mindset regarding landscape aesthetics. This garden at Bethpage State Park Golf Course is an excellent example of entropy. 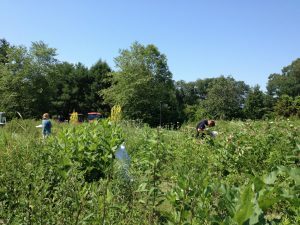 Primarily established with native wildflowers, there are also a significant number of volunteers. 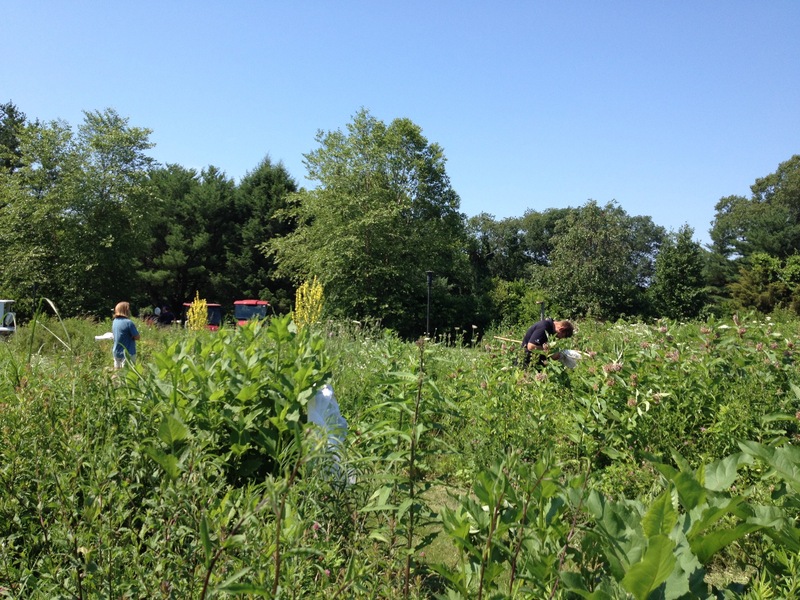 NYS IPM staff found over 100 different species of insects, primarily bees and wasps, taking advantage of the bounty. Increasing the entropy on one’s property is as easy as falling off a log (which of course is a literal example of increased entropy). 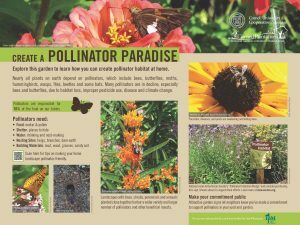 Pollinators need plants which bloom at all different times, grow at various heights, and have a multitude of flower shapes and structures. For greater abundance and diversity of wild flowering plants, all you need to do is stop. Stop constantly mowing everything. Choose some places to mow once a year in the late fall, and others where you will mow every second third year. 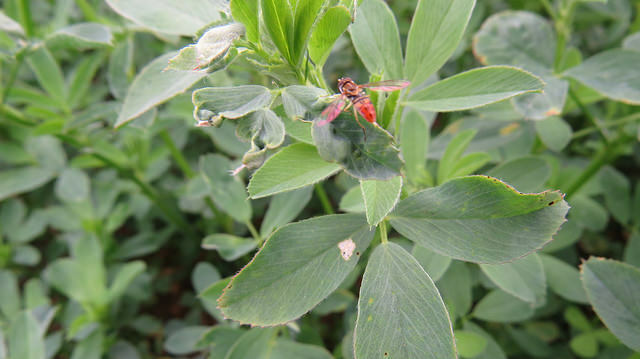 Stop using herbicides, both the broadleaf kind and the non-selective type. Before you know it, elderberry and raspberry will spring up. Woody plants like dogwoods and viburnums will start to appear. Coltsfoot and dandelions, essential early-season flowers, will come back. Asters and goldenrod (which by the way do not cause allergies), highly important late-season sources of nectar and pollen, will likewise return. Wild grape, virgin’s bower, Virginia creeper and wild cucumber will ramble around, without any help whatsoever. 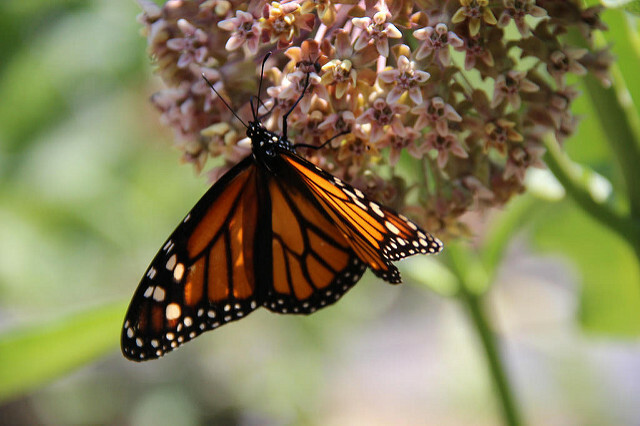 However, you may choose to help this process along by sowing perennial or self-seeding wildflowers like purple coneflower, foxglove, bee balm, mint, or lupine. Even dandelion is worth planting. You’ll not only get more wild pollinators, you’ll also see more birds. Redstarts, tanagers, orioles, hummingbirds, catbirds, waxwings and more will be attracted to such glorious neglect. No feeders required. I strongly advocate for more chaos in the plant department, even if the local Chamber of Commerce or Tourism Board frowns upon it. Remember, just because you’re an unkempt community doesn’t mean you have to change the name of your town. Many thanks to Paul for letting us share his piece! 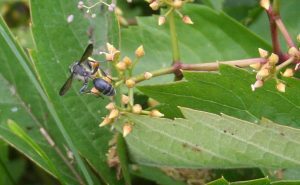 For more information on protecting pollinators and enhancing their habitat, visit the New York State Integrated Pest Management Program’s pollinators webpage. Ephemeral: ground-nesting bees are pollinators of early blooming flowers. Because their lifecycle is tied to the cycle of these plants, ground bees are only active for a short period of time in early spring. 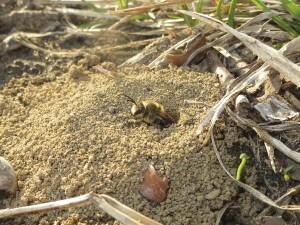 Two female ground bees hunker down in their burrows in response to movement. Solitary: fear of bees arises from the idea that disturbing a nest will provoke an entire colony of stinging insects. However, as it true of carpenter bees, cicada killer wasps, and mud dauber wasps, ground bees are solitary with only a single female bee per mound. Shy Gals: female bees make nests for the purpose of reproduction. After gathering nectar and pollen as food for their offspring, females will mate and lay eggs in the nest. While in the nest, females appear shy, and will retreat into the burrow if they see an approaching object. Males Hover, but Can’t Sting: All those bees you see flying low to the ground en masse – are males! And male bees do not possess a stinger. Their low, hovering flight is part of their effort to pair up with a female. Indeed, male ground bees are quite docile. Male ground bees cannot sting and are quite docile. If you wish to discourage ground bees from living in your yard, an effective, safe and long-term solution is over-seeding with grass. By creating a dense lawn, bees will not be able to dig in the soil and will nest elsewhere. 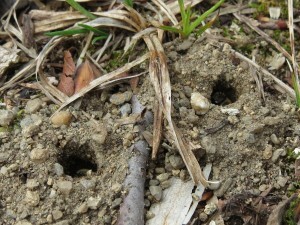 For more information please see Ground nesting bees in your backyard!